Technology-induced unemployment was already on the minds of classical economists. David Ricardo, writing in 1821, added a whole chapter to his book on political economy, arguing that “the substitution of machinery for human labour, is often very injurious to the interests of the class of labourers.” The idea that rapid technological change would immiserise the working class and ultimately lead to social unrest was also at the core of Karl Marx's predictions. A crucial question is why some places adopted the new technology before others. 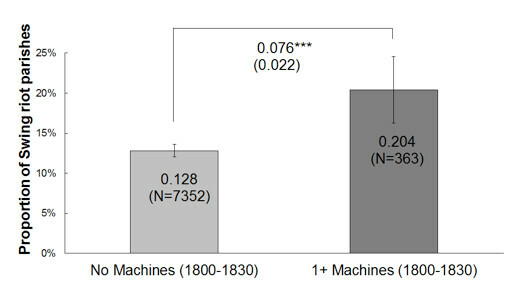 If take-up was driven by factors that could also directly influence unrest, we would not identify a clean effect of labour-saving machines on unrest. Also, the estimates may be biased downwards if landlords feared unrest, and consequently introduced fewer machines. 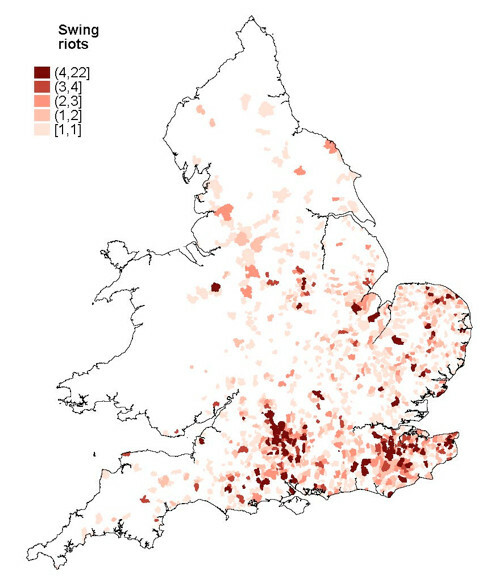 To pin down causality and gauge magnitudes correctly, we look at the nature of a parish's soil. 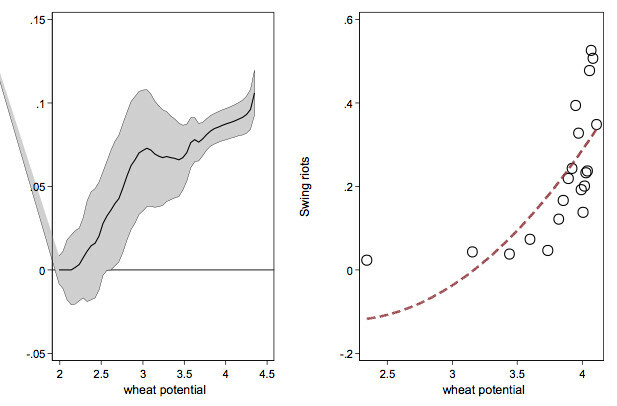 In particular, we examine soil suitability for wheat, as established by the Food Administration Organization (FAO). The FAO classifies all the world's land by suitability for various crops. 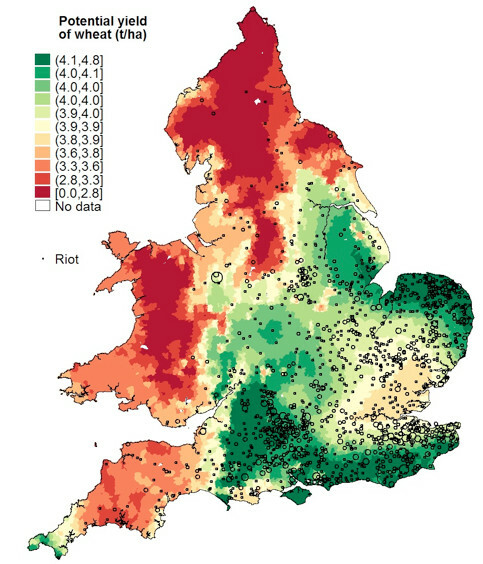 We use modern-day data on England's soil to see how suitable different parishes were for the cultivation of wheat. The reason why we care about wheat is that it was the only grain suitable for machine threshing – other grains, like rye and barley, could not be threshed economically by early threshing machines. Aidt, T S and R Franck (2015), “Democratization Under the Threat of Revolution: Evidence From the Great Reform Act of 1832”, Econometrica 83(2): 505–47. Aidt, T S, G Leon, and M Satchell (2016), “The Social Dynamics of Riots: Evidence from the Captain Swing Riots 1830-1831”, working paper. 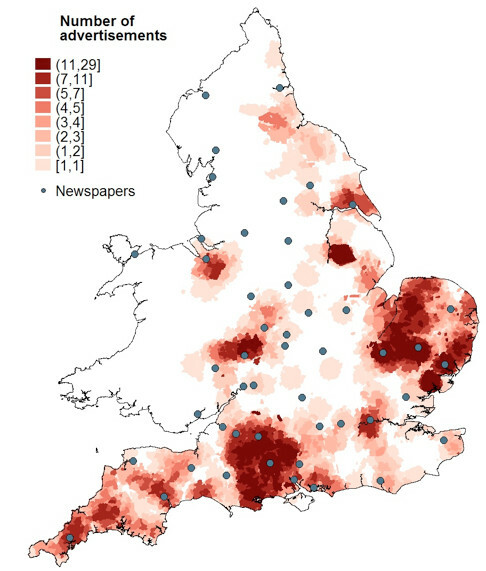 Caprettini, B, and H-J Voth (2017), “Rage against the Machines: Labour-Saving Technology and Unrest in England, 1830-32”, CEPR Discussion Paper 11800. Holland, M (ed.) (2005), Swing Unmasked: The Agricultural Riots of 1830 to 1832 and Their Wider Implications, FACHRS Publishing. Hurst, E (2016), “Video Killed the Radio Star,” speech at the 527th Booth Convocation, Chicago Booth School of Business, Chicago. Leontief, W (1983), “Technological Advance, Economic Growth, and the Distribution of Income”, Population and Development Review 9(3): 403-10. Mokyr, J, C Vickers, and N L Ziebarth (2015), “The History of Technological Anxiety and the Future of Economic Growth: Is This Time Different?”, Journal of Economic Perspectives 29(3): 31–50. Ricardo, D  (1996), Principles of Political Economy and Taxation, Great Minds Series, Prometheus Books. Summers, L H (2013), “Economic Possibilities for Our Children,” NBER Reporter. Voth, H-J (2001), Time and Work in England 1750-1830, Oxford University Press.